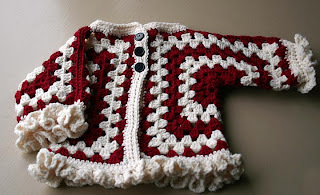 My version of this cute jacket was inspired by Bev's Hexagon Baby Jacket; which, in turn, was inspired by one posted on Tina's blog. There's even a 'filled-in' version here. In addition to increasing the size, I added a stand-up collar, and put ruffles at the cuffs and hem for a more feminine look. The jacket's dimensions are easily customized by changing yarn and/or hook size. 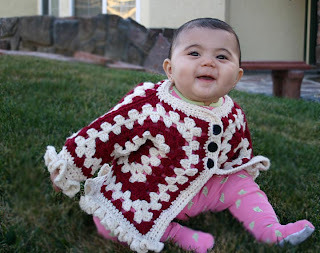 For example, the newborn size uses DK weight yarn and an "F" hook; Bev's 3-6 month size uses a soft 4-ply worsted yarn and a "G" hook; my version uses worsted weight yarn with an "I" hook. Enjoy! 2 colors worsted weight yarn (such as Lion Brand Wool-Ease or Plymouth Encore); approx 200 yd each. 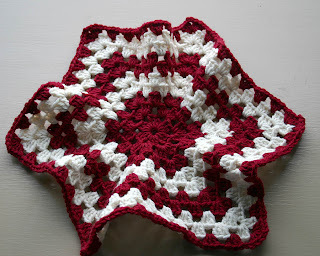 Across jacket under arm front = 10 ½"
Start Hexagon (make 2): Ch 4, join to make a ring. Ch 3, (counts as first dc), 2 dc inside ring. *Ch 2, 3 dc in ring. Ch 2, join with slip stitch to 3rd ch of beginning ch3. Slip stitch in next stitch and into ch 2 space. Ch 3, 2 dc in same space. Ch 2, 3 dc in same space. Ch 1, join with slip stitch to 3rd ch of beginning ch3. Ch 3, 2 dc in same space.Ch 2, 3 dc in same space. *Ch 1, 3 dc in next ch 1 space. Ch 1, (3 dc, ch 2, 3 dc) in next corner. Repeat from * 5 times around. Ch 1 (3 dc, ch 2, 3 dc) in next corner space. Fold hexagons to form 2 sides of the jacket (see photo); fasten top seam with stitch markers to hold in place. Working in outside loops only, stitch shoulder seams across top of jacket from cuff to third 3dc-group from front neck edge. Repeat for second shoulder. 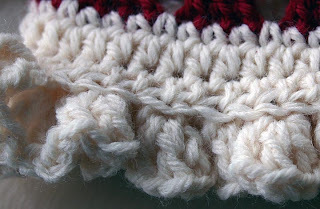 Using contrast yarn, join with slip stitch anywhere on cuff edge. sc in each stitch and chain-1 space around. 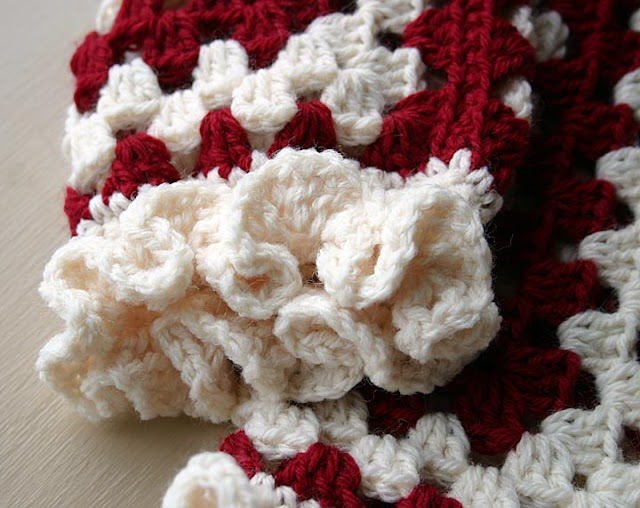 Join with slip stitch to beginning slip stitch. Ch1, sc in same stitch. Join with slip stitch in first sc. Ch2, hdc in same stitch and each stitch around. (dc, ch 1, dc, ch 1) in same stitch as join. *(Dc, ch 1, dc, ch 1, dc, ch 1) in next stitch. 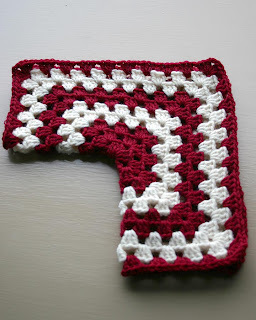 Join with a slip stitch in 3rd chain of beginning ch 4. Fasten off. Join contrast color with slip stitch in center back of jacket. 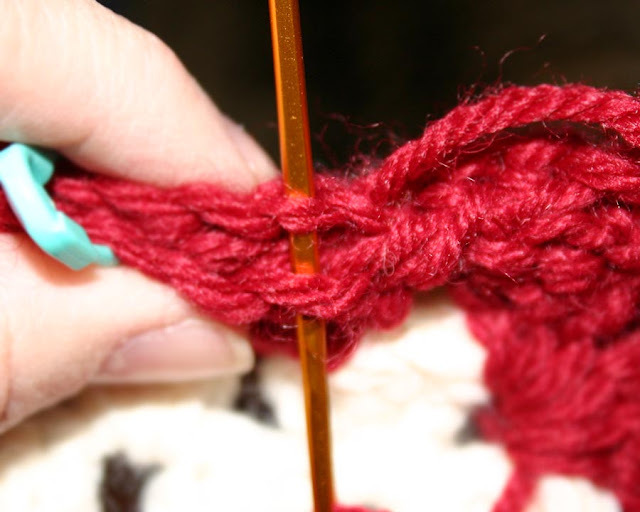 Slip stitch in first sc. Fasten off. With right side facing you and bottom of sweater facing up, join yarn in right corner on bottom of sweater. Ch 2, hdc in same stitch and each stitch across. Ch 2, turn. With wrong side facing, join yarn in bottom corner of left front. Ch 2, hdc in same stitch and each stitch up right front – with (hdc, ch1, hdc) in center corner stitch - around neck, to right front corner. hdc to end of row (do not hdc in side of ruffle). Sc in each stitch around, working 3 sc in each ch3 space and (sc, ch1, sc) in each corner. Fasten off. Weave in ends. Sew on buttons. Enjoy!